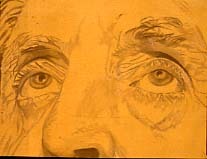 In the demonstration painting, Captain Archie Ross, I applied a layer of transparent color, often referred to as an imprimatura, to the entire painting. I've mixed Old Holland yellow lake with liquin (7 parts medium to 1 part oil paint) and applied it with a smooth surface house painting roller. I then painted a second layer of transparent color, Old Holland red lake (same mixture as above), into the flesh areas to give them a more reddish appearance. For the imprimatura, Williamsburg alizarin yellow may be substituted for yellow lake. If the subject has a darker skin tone, all of the flesh may be covered with Williamsburg Quinacridone Brown mixed as indicated above with liquin. Again, the yellow lake may be selectively withheld from some areas of a painting if those areas are to be painted with a complimentary color. The choice of color being dictated by the various subjects.